We present RCP 4.5 and 8.5 projections for the Greenland glacial system with the new glacial system model IGLOO 1.0, which incorporates the ice sheet model SICOPOLIS 3.3, a model of basal hydrology and a parameterization of submarine melt of outlet glaciers. 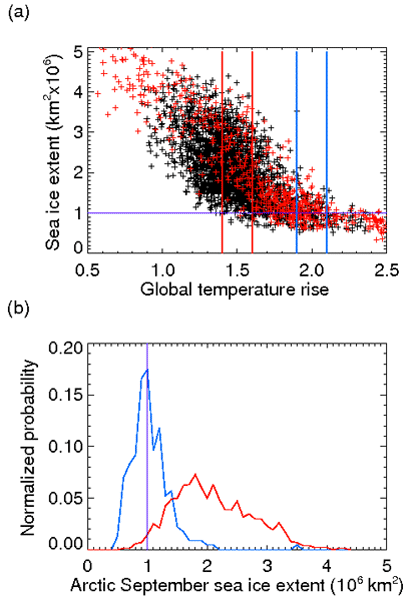 Surface temperature and mass balance anomalies from the MAR climate model serve as forcing delivering projections for the contribution of the Greenland ice sheet to sea level rise and submarine melt of Helheim and Store outlet glaciers. Cook Glacier, as one of the largest in East Antarctica, may have made significant contributions to sea level during past warm periods. However, despite its potential importance there have been no long-term observations of its velocity. 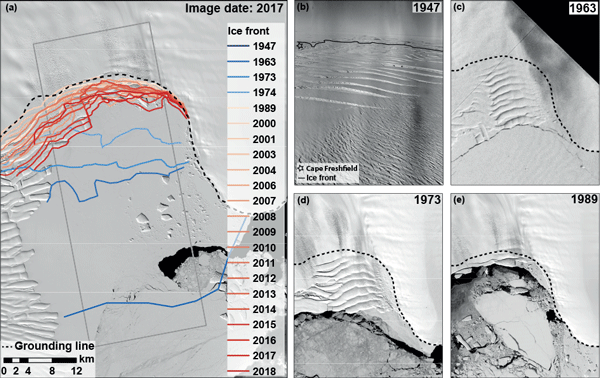 Here, through estimating velocity and ice front position from satellite imagery and aerial photography we show that there have been large previously undocumented changes in the velocity of Cook Glacier in response to ice shelf loss and a subglacial drainage event. 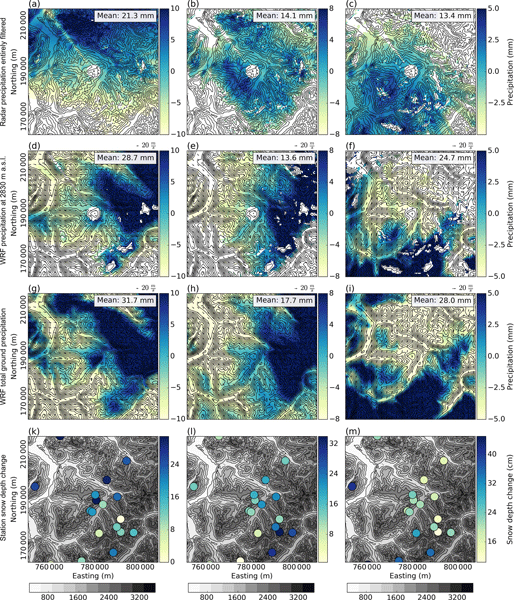 A comparison of winter precipitation variability in operational radar measurements and high-resolution simulations reveals that large-scale variability is well captured by the model, depending on the event. Precipitation variability is driven by topography and wind. A good portion of small-scale variability is captured at the highest resolution. This is essential to address small-scale precipitation processes forming the alpine snow seasonal snow cover – an important source of water. The amount of water stored in snow cover is of high importance for flood risks, climate change, and early-warning systems. We evaluate the potential of using GPS to estimate the stored water. We use GPS antennas buried underneath the snowpack and develop a model based on the path elongation of the GPS signals while propagating through the snowpack. The method works well over full seasons, including melt periods. Results correspond within 10 % to the state-of-the-art reference data. Cryoconites from glaciers on the Tibetan Plateau and surrounding area were studied for iron oxides. We found that goethite is the predominant iron oxide form. Using the abundance, speciation and optical properties of iron oxides, the total light absorption was quantitatively attributed to goethite, hematite, black carbon and organic matter. Such findings are essential to understand the relative significance of anthropogenic and natural impacts. 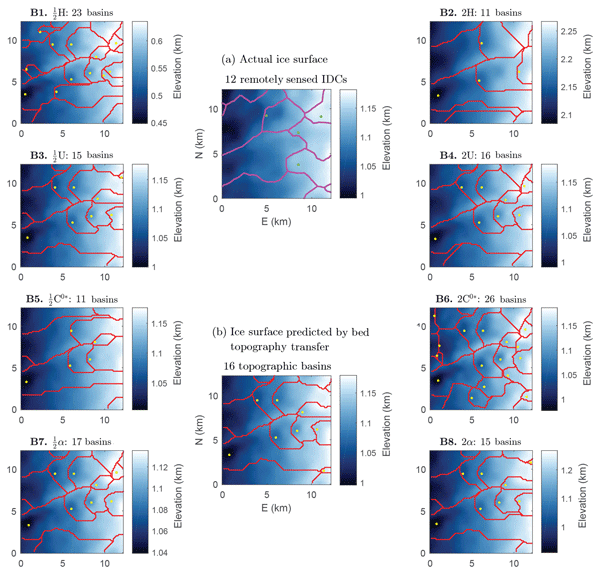 The paper includes a model that can be used to predict zones of fracture formation in both floating and grounded ice in Antarctica. 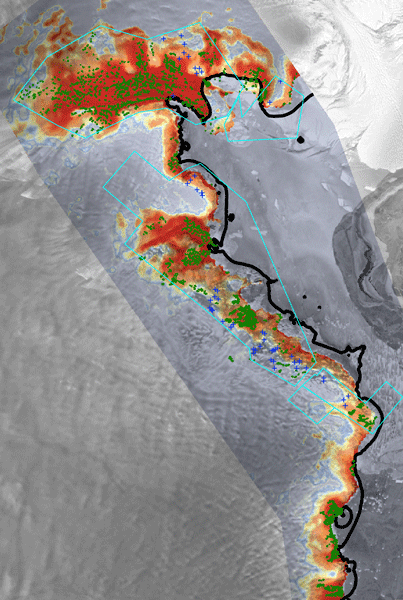 We used observations and a statistics-based model to predict fractures in most ice shelves in Antarctica as an alternative to the damage-based approach. We can predict the location of observed fractures with an average success rate of 84% for grounded ice and 61% for floating ice and mean overestimation error of 26% and 20%, respectively. At its surface, an ice sheet is closely connected to the climate. 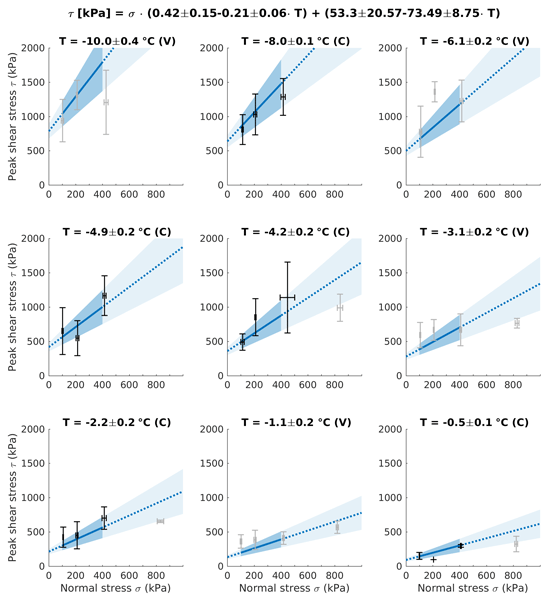 Assessing heat transfer between near-surface ice and the overlying atmosphere is important for understanding how the ice sheet is melting at the surface. We measured ice temperature within 20 m of the surface of the Greenland Ice Sheet. Resulting ice temperatures are warmer than the air, a peculiar result which implies the role of some nonconductive heat transfer processes such as latent heating by refreezing meltwater. Accurately representing grounding-line flux is essential for modelling the evolution of the Antarctic Ice Sheet. 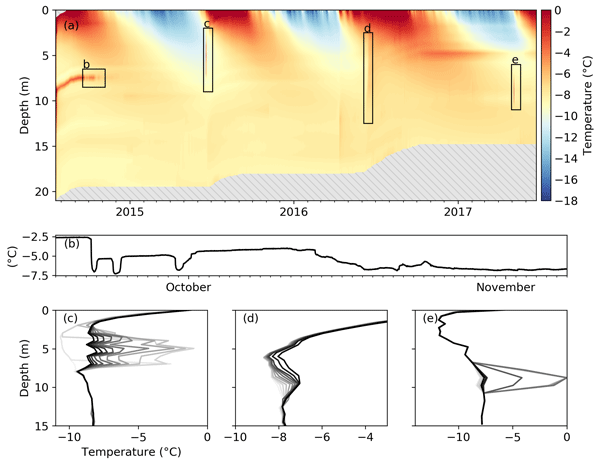 Currently, in some large-scale ice-flow modelling studies a condition on ice flux across grounding lines is imposed using an analytically motivated parameterisation. Here we test this expression for Antarctic grounding lines and find that it provides inaccurate and partly unphysical estimates of ice flux for the highly buttressed ice streams. The dynamic behaviour (i.e. 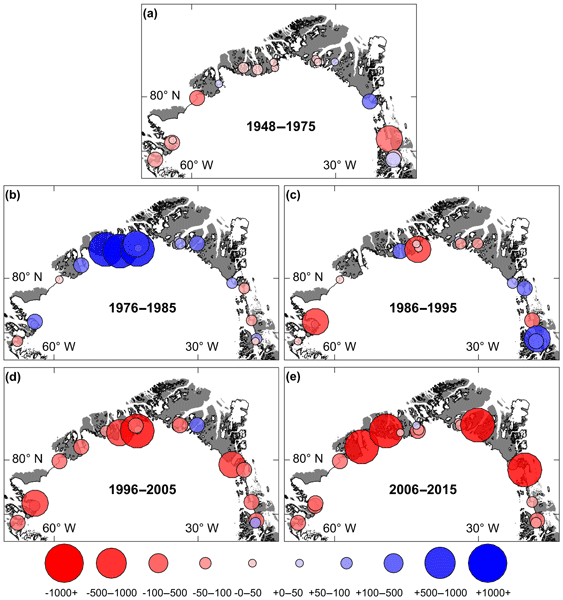 acceleration and retreat) of outlet glaciers in northern Greenland remains understudied. Here, we provide a new long-term (68-year) record of terminus change. Overall, recent retreat rates (1995–2015) are higher than the last 47 years. 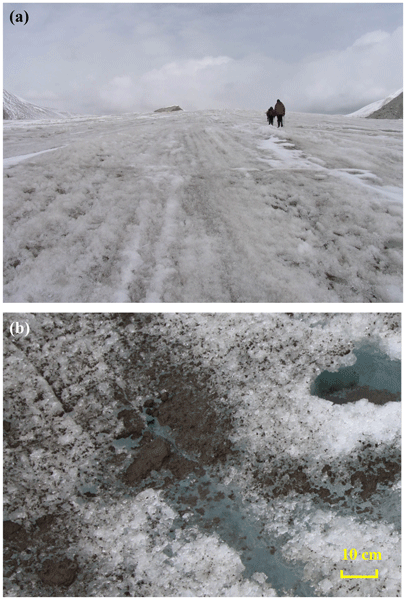 Despite region-wide retreat, we found disparities in dynamic behaviour depending on terminus type; grounded glaciers accelerated and thinned following retreat, while glaciers with floating ice tongues were insensitive to recent retreat. The latest/recent generations of global climate models do not simulate the recent (last 30 years) increase in atmospheric high pressure over Greenland in summer but rather projects decreasing pressure. This difference between climate models and observations raises serious questions about the ability of the models to accurately represent future changes in Greenland climate and ice-sheet mass balance. There are also likely effects on climate predictions downstream, e.g. over Europe. 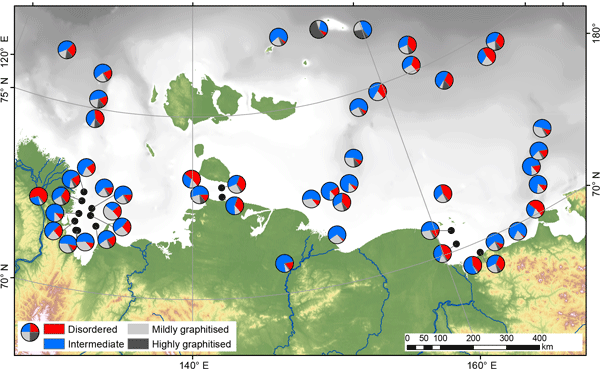 Ongoing climate change in the Siberian Arctic region has the potential to release large amounts of carbon, currently stored in permafrost, to the Arctic Shelf. Degradation can release this to the atmosphere as greenhouse gas. We used Raman spectroscopy to analyse a fraction of this carbon, carbonaceous material, a group that includes coal, lignite and graphite. We were able to trace this carbon from the river mouths and coastal erosion sites across the Arctic shelf for hundreds of kilometres. The fast retreat of Alpine glaciers since the mid-19th century documented in photographs is used as a symbol for the human impact on global climate, yet the key driving forces remain elusive. Here we argue that not industrial soot but volcanic eruptions were responsible for an apparently accelerated deglaciation starting in the 1850s. 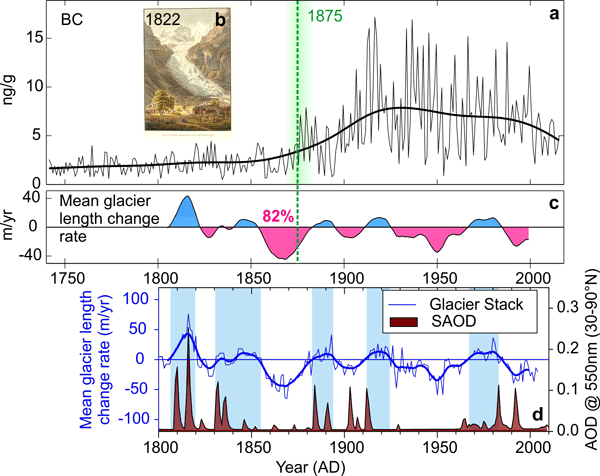 Our findings support a negligible role of human activity in forcing glacier recession at the end of the Little Ice Age, highlighting the role of natural drivers. Most of the observed failures in permafrost-affected alpine rock walls are likely triggered by the mechanical destabilisation of warming bedrock permafrost including ice-filled joints. 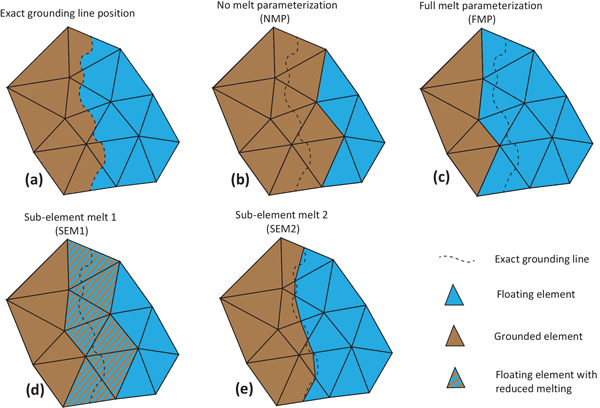 We present a systematic study of the brittle shear failure of ice and rock–ice contacts along rock joints in a simulated depth ≤ 30 m and at temperatures from −10 to −0.5 °C. Warming and sudden reduction in rock overburden due to the detachment of an upper rock mass lead to a significant drop in shear resistance. The climate change conference held in Paris in 2016 made a commitment to limiting global-mean warming since the pre-industrial era to well below 2 °C and to pursue efforts to limit the warming to 1.5 °C. Since global warming is already at 1 °C, the 1.5 °C can only be achieved at considerable cost. It is thus important to assess the risks associated with the higher target. 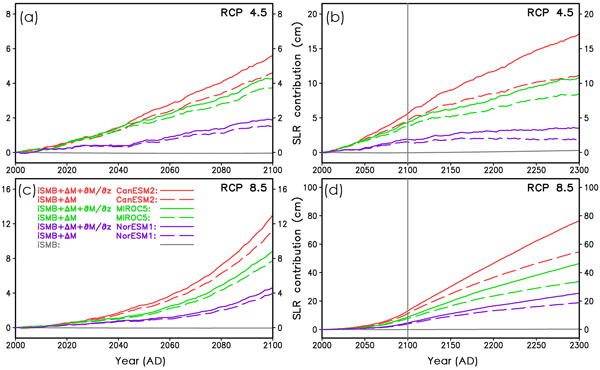 This paper shows that the decline of Arctic sea ice, and associated impacts, can only be halted with the 1.5 °C target. Ice shelves are thick sheets of ice floating on the ocean off the coasts of Antarctica and Greenland. They help regulate the flow of ice off the continent. Ice shelves undergo a natural cycle of seaward flow, fracture, iceberg production and regrowth. The Brunt Ice Shelf recently developed two large cracks. We used ground-penetrating radar to find out how the internal structure of the ice might influence the present crack development and the future stability of the ice shelf. Significant reductions in Arctic sea ice and snow cover on Arctic land have led to increases in absorbed solar energy by the surface. Does one play a more important role in Arctic climate change? 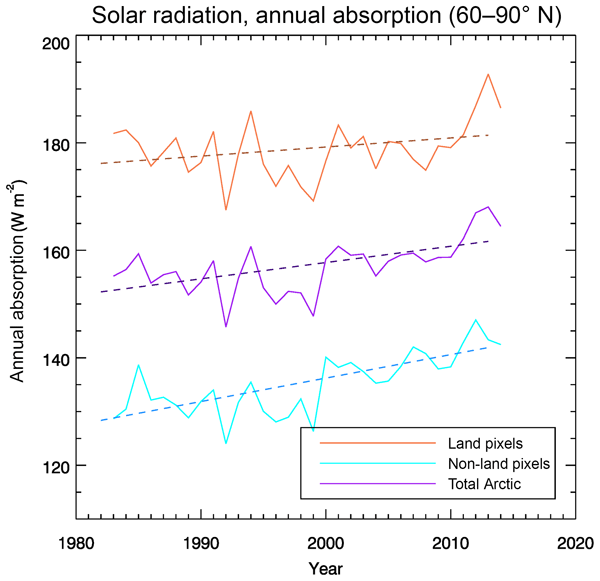 Using 34 years of satellite data we found that solar energy absorption increased by 10 % over the ocean, which was 3 times greater than over land. Therefore, the decreasing sea ice cover, not changes in terrestrial snow cover, has been the dominant feedback mechanism over the last few decades. Understanding ice sheet surface meltwater routing is important for modeling and predicting ice sheet evolution. 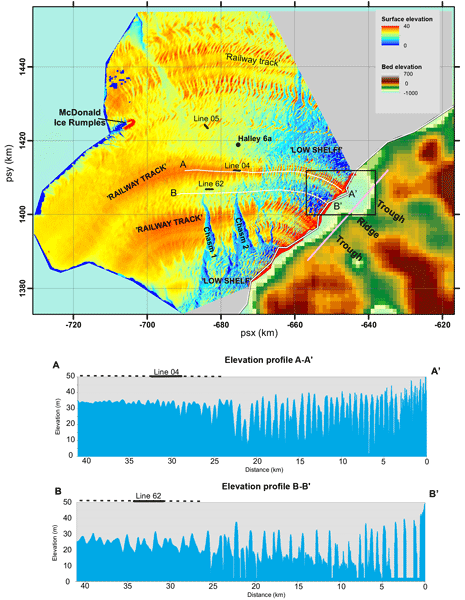 We determined that bed topography underlying the Greenland Ice Sheet is the primary influence on 1–10 km scale ice surface topography, and on drainage-basin-scale surface meltwater routing. 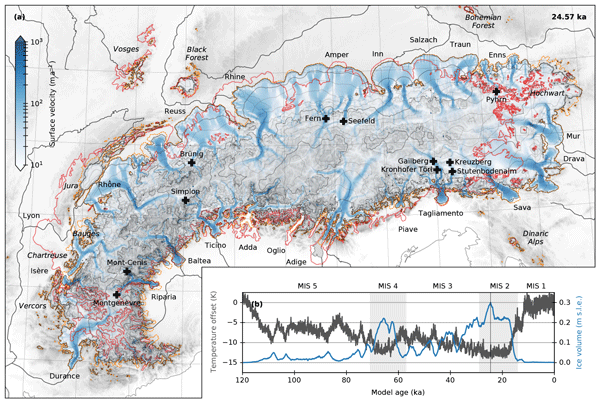 We provide a simple means of predicting the response of surface meltwater routing to changing ice flow conditions and explore the implications of this for subglacial hydrology.